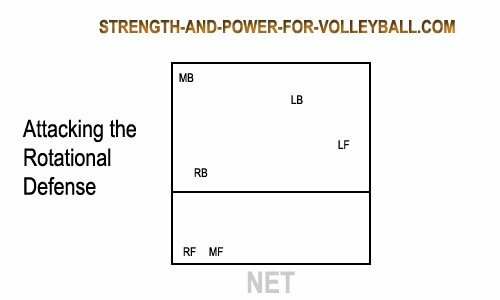 Rotational defense, or man back defense, is probably the most common defense played in women's volleyball. The goal is to cover a mix of tips and swings. 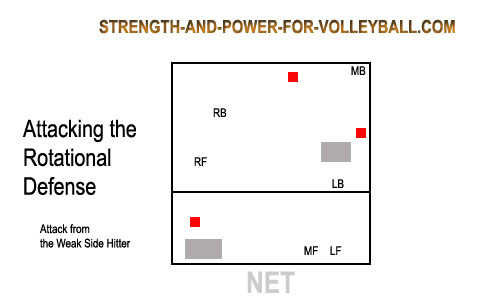 The following volleyball graphics show how a team can attack this defensive system. The gray and red markings on the following graphics show where to attack the ball when attacking against the rotational defense. The gray spots are where to tip or hit a shot. The red spots are where to hit the ball hard. 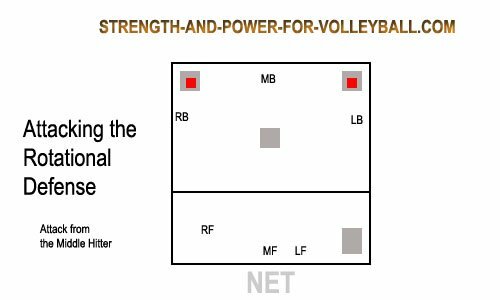 The above graphic shows the rotational defense for defending a set to the outside hitter (the attack coming from the attacker on the left side of the court). When a ball is set high to the outside, the left-front blocker needs to rotate back off the net, about one step behind the 3-meter line and one step inside the sideline. It's okay to give up the radical sharp angle shot that lands inside the 3-meter line. Any sharper angle than that is unlikely. Your focus should be to get in the flight path of the shot that is most likely to be hit. If the left-front can effectively get off the net, this allows the left-back player to drop back and cover the deeper cross-court angle shot. This cross court attack is a shot many attackers like to hit. In this defense, the left-back usually concedes the corner shot. However, if the opposing attackers are continually hitting balls to the corner, the left-back should shift over to cut off the deep corner shot. If you're a younger player and you're in the left-front position, it might be hard for you to get behind the 3-meter line, especially on a quick set to the outside. That's okay. Take large steps and get back as far as you can. You should attempt to straddle the 3-meter line. There are a few key advantages to using this style of volleyball team defense. Your team more effectively covers tips directly behind the block. The hits deep line are easier to play. The setter can quickly transition from defense to offense. There are also many disadvantages. This defense requires a lot of movement. Transitioning from defense to offense can be difficult. Seams are created between wing defenders because so much movement is required. The middle back is wide open against many outside attack hits. Another weakness in the rotational defense is the play of the middle back player. Middle back needs to be mobile because they are required to move a great distance. 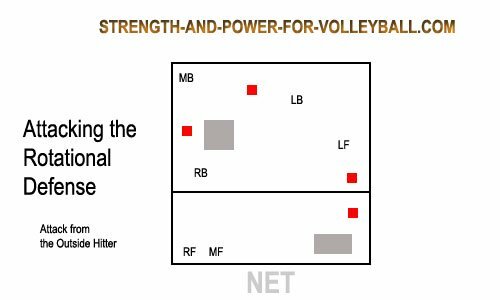 For example, middle back has to move from coverage of the outside hitter back to their defensive position very quickly.